(2005-2010'Broke & Hungry')((108:50/30) 'A Broke & Hungry Records retrospective with 14 previously unreleased recordings (*). 03 Six Little Puppies * HOLMES, Jimmy Duck""
04 It's Over HOLMES, Jimmy Duck""
05 All Night Long HOLMES, Jimmy Duck""
06 I'd Rather Be The Devil HOLMES, Jimmy Duck""
07 Eyesight To The Blind * HOLMES, Jimmy Duck""
08 Take A Trip (Partial take) * HOLMES, Jimmy Duck""
09 The Wolves Are Howling JEFFERSON, Wesley Junebug""
10 Cooter Mae * JEFFERSON, Wesley Junebug""
11 Meet Me In The Bottom JEFFERSON, Wesley Junebug""
12 Pretty Baby * BEAN, Terry Harmonica""
13 Bean's Boogie * BEAN, Terry Harmonica""
14 Laudromat Blues * BEAN, Terry Harmonica""
15 Who's Gonne Be Your Sweet Man When I'm Gone * BEAN, Terry Harmonica""
24 Taking Chances * WILLIAMS, Terry Big T""
25 Incarcerated Blues WILLIAMS, Terry Big T""
28 Ain't It Alright BOYCE, R.L. 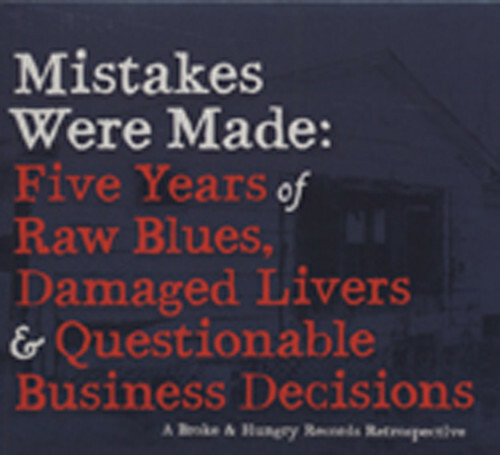 Customer evaluation for "Mistakes Were Made: Five Years Of Raw Blues (2-CD)"